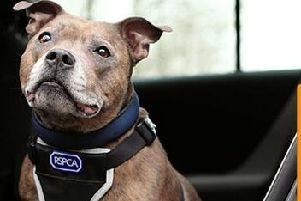 Rescue dog Roxy is in need of a loving home. Could you take her in and give her the love she needs? Roxy is a Staffordshire Bull Terrier cross. She is a lovely young lady, who is only five-years-old. Roxy is a sweet timid girl who is very loyal and affectionate once she settles. It is felt that Roxy would settle better in a quieter household as she doesn’t like loud noises. If given her own space, lots of love, time and patience, Roxy will make a lovely, trusting companion. Roxy needs experience owners and she will thrive, she has so many good qualities, she’s a beautiful girl and once you get to know her, she will make your heart melt. If you would like to visit the animal shelter you can find it at 32 Nottingham Road, Radcliffe on Trent, Nottingham, NG12 2DW. Alternatively ring the shelter on: 0115 8550222.